Tana is the best sort of hero in that it's difficult to give her a truly bad IV, particularly with three superboons and no superbanes. She can make almost anything work, though focusing on Speed, Attack, and Defense in that order would generally be for the best. She can even make a Resistance boon shine- her stats and kit are versatile enough to build excellently around any IV she's presented with. +SPD: This brings Tana up to 39 Speed, which makes her very good at performing with Speed-based builds. She works well with weapons like Firesweep Lance, Brave Lance, and Slaying Lance with a Speed boon. +ATK: This IV will help Tana pack a far more powerful punch and allows her to be flexible with all of her builds. With an Attack boon, she can effectively run her native Vidofnir, or pick up a Slaying Lance or even a Brave Lance. DEF: Defense is not a bad stat to get a boon in, particularly when considering her Vidofnir gives her the ability to work well in the ENemy Phase. Still, it's not quite her top priority, and so if it's neutral then you're in a pretty good spot. -RES: Even with a Resistance boon, Tana can still get some momentum out of countering dragons now that Vidofnir is effective against them, but it is less helpful on her than her Defense, Attack, or Speed. -HP: Her ideal bane, simply because she has the opportunity to use most of her other stats. This makes her HP rather low though, so if you do wind up with an HP bane, keep in mind that she's a little more fragile. Tana’s exceptional offensive stats allow her to run a Firesweep build very effectively. This build is geared towards offense, letting her function as a pseudo Brave weapon user. With the Quickened Pulse Seal, she can activate Moonbow on her first fight, provided she scores a follow-up attack. She can do this more consistently if Heavy Blade procs, allowing her constant Special activations- but this is contingent on her Attack being higher than her opponent's, and 54 base Attack can sometimes miss that threshold, particularly if she's attacking into armor units. Life and Death is the optimal choice for this build's A slot, as her defenses don't particularly matter and she wants every point of Attack and Speed she can get. Lacking that, Swift Sparrow also functions just fine, as she will not be used in Enemy Phase anyway. For her B slot, Hit and Run works defensively, and has synergy with Guidance: it makes space for an ally to follow-up on enemies she cannot OHKO. Chill Spd or Swordbreaker are also options that you can use as even with 44 Speed (50 with Hone Fliers) she will have difficulty doubling the speediest units, which generally happen to be sword wielders. Her C slot can be her team buff of choice, but it works ideally as a way to support the tankier or Enemy Phase units on your team- this Tana cannot bait, but she can support those who can through team buffs. Put together, this is a very similar set to what Cordelia might run; however, lacking Cordelia's 1 point of Attack and focusing on her extra 1 point of Speed, Tana is more efficient at finishing off an opponent with Special activation on double attacks than she is trying to ensure Heavy Blade procs for those risky 1-turn Galeforce builds. On a mixed team, Tana can increase all of her stats with only her Vidofnir, granting her a +3/+4/+4/+7/+7 when within 2 spaces of an armored or infantry ally. This has great synergy with her default Guidance skill, as she can allow her teammates to teleport around the battlefield near her. With a skill like Aerobatics, she's able to take advantage of the positioning of her allies to move up to 4 tiles as well, and incorporating them both allows for a highly flexible and mobile team centered on only one unit. Fury is taken again because it raises all of Tana's stats at once, which she uses with Vidofnir to become incredibly flexible in both Player and Enemy Phase. Alternatives can be Swift Sparrow if you're intending to use her more during the Player Phase, Close Defense if you want to use her more in the Enemy Phase, or Brazen Atk/Def if you're considering making her more of a brawler. Desperation or Chill Def are equally good in her B slot, though Chill Def helps her to support both herself and her team more while Desperation has better synergy with Fury. And finally, her C slot is good for buffing her allies- whether through Waves or Tactic skills, she's determined to be helpful however she can be! The legendary Vidofnir has proven its worth over the Tannenboom! with its latest refine, which allows both stat refines in addition to becoming effective against dragons (Defense-forged Tannenboom! grants +5/+2/+2/+6/+2 against all units in Enemy Phase as opposed to Defense-forged Vidofnir +5/+0/+0/+11/+7 or Eff-forged Vidofnir's +3/+4/+4/+7/+7 against melee units in Enemy Phase), Tana is still very capable of running a defensive set with a staggering Close Def 6 and flier buffs. On a Defense boon Tana, Vidofnir with this build offers her an 52 effective Defense, with more potentially added on with Fortify Fliers for a total of 54 Defense- all without losing a hint of her 36 Speed or 50 Attack. Through this, she's an extremely effective bait unit, as many other units will have difficulty doubling her. Her retaliation is guaranteed to be a double attack thanks to Quick Riposte, and if she has a 2 cooldown Special like Moonbow or Glimmer, though Bonfire will have a far higher damage proc. Selecting a Speed boon or a Speed refine further helps her tanking ability by shutting down even more doubles against her- this also might allow you to run Renewal or Vantage over Quick Riposte in her B slot. Threaten Atk in her C slot helps Tana to take more 0s from her exchanges, though it can easily be replaced by a C slot that helps her potential flier teammates or increase mobility for armor/infantry teammates. If you choose to run Renewal in her B slot then Quick Riposte can be run as a Seal, though it prevents her maximum damage mitigation from Close Def in the Seal slot. Aether can be chosen as her Special for a bit of healing as an alternative. It's difficult to state just how flexible Tana can be when taking into account her stats and her Vidofnir. Her Defense superboon allows her to reach 29 Defense; conversely, her Speed boon allows her to reach 39 Speed. Both can be valuable depending on what you want to do with her- and, of course, an Attack boon is always something to be thankful for. Tana is capable of running a Fury/Desperation set to her great advantage, as Fury will get a +SPD Tana over 40 Speed. Combined with a Speed refine on her Vidofnir or on a a Slaying Lance, Tana will easily double most things in her path with a charged Luna proc. The damage she takes in her Player Phase, coupled with her Fury self damage, will allow her to reach Desperation very quickly, at which point she can function as a pseudo-brave unit. An offense/defense hybrid build can be attempted instead with one of the Bond skills, which allows Tana to get impressive +5/+5 stat boosts when positioned next to an ally... which, for fliers, is not a difficult task to achieve. For this, it's important to focus on what you want her to accomplish: she can easily reach 50 Speed if running her with a Bond skill that increases her Speed, but if you'd prefer to keep her with Vidofnir then you may want to focus more on stacking her defensive and offensive power with Atk/Def Bond. Either way, it's unlikely that she'll be doubled and even if she is, she'll take little damage and retaliate harshly. Tana is a flying melee all-rounder, with a fantastic offensive stat spread combined with a legendary weapon that gives her strong defensive options. She can fit into flying teams seamlessly, or even take a spot in a mixed team thanks to Guidance and Vidofnir's refine. However, Vidofnir does not protect from bows, daggers and tomes, which combined with her low Resistance make her weak to ranged attackers. Tana is comparable to Cordelia due to their similar offensive spreads, but she is far more versatile, though it's more difficult to find her with optimal IVs due to her 5 star availability. Her Speed stat at 36 is rather high, and with a boon in Speed and a synergistic A slot skill she will have no issue doubling most opponents she comes across. Conversely, her 16 mt weapon combines with her natural 34 Attack for a base 50 damage before other skills, which makes her fantastic at applying damage as well. Her legendary weapon, the Vidofnir, even allows for her to build up an ironclad Defense, making her untouchable by melee units in the enemy phase. All of this combined means that Tana can be a very versatile unit with a bit of a 'fire and forget' playstyle. It's easy to move her into the enemy range for a kill and not have to worry about repositioning her out. She makes for a great vanguard due to her ability to take punishment in the Enemy Phase, and can successfully bait most melee units in the game. Due to all of this, Tana is highly sought out and is widely considered to be at the top of the pack for blue lance fliers. Tana comes out of the box with 34 Attack and 36 Speed, the same offensive stat spread that once made Lucina one of the best units in the game. She has one of the higher Speed stats among other blue lance fliers, and while her Attack is slightly lower than Hinoka, Cordelia, and Est, she makes up for this with a 16 mt legendary weapon. Vidofnir offers Tana several unique advantages: firstly, it helps to patch up her Attack, making her neutral Attack rest at a healthy 50 damage. Secondly, Vidofnir allows Tana to take a beating in Enemy Phase. Through this weapon, she can adapt to whatever the situation needs of her and is a great unit to initiate with. Vidofnir's refine allows Tana to take a stat refine for even further damage, Speed, or tanking- or her Effect refine can be granted to give her more team synergy with Infantry or Armored allies. Can run many different builds. 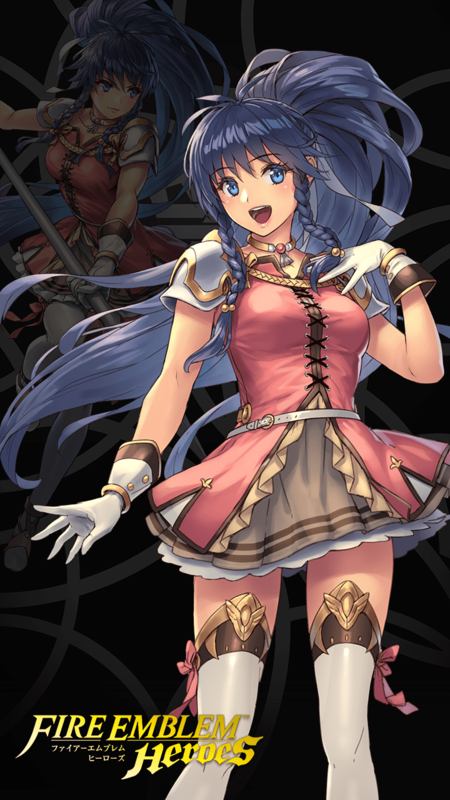 Due to her always-salvageable stat spread, her unique lance, and the myriad of options for lance weapons in the game, Tana is a jack of all trades and can fit into whatever sort of role you need from her. Her offensive stats are superb enough to run sets incorporating Firesweep or Brave Lance, as she can easily be built to double most units in the game with Firesweep and can run a quad or Death Blow build with Brave. Her defensive stats, while not the best in the game, are supplemented by her high Speed which allows her to build around her Resistance or Defense (with her native Vidofnir) to make her a highly effective Enemy Phase unit. Loses bulk in Player Phase. It is important to note that Vidofnir’s defensive bonuses do not apply on rounds where Tana initiates combat, making her susceptible to retaliation damage when attacking. If you rely on Vidofnir to supplement her bulk on Enemy Phase then she will seem weaker in Player Phase. This can hinder her ability to initiate during player turn and it may be necessary to use her as a bait unit if not running her with Firesweep or Brave Lance. This also lowers the damage of any stat-based specials she might proc such as Bonfire or Ignis. Care should be taken to ensure that her Special procs happen mostly in enemy turn where she gains her significant stat boost. As a flier, Tana is inherently weak to arrows, and Vidofnir does not protect her from that- bow units in general are a massive threat to her an will make you remember how limited 25 defense can really be. Vidofnir also does not protect against tomes or ranged damage and her unusually low Resistance (for a blue flier) means that green mages will have no trouble at all dispatching her. Tana’s versatility enables her to be a strong choice for nearly any team. Fliers: There's no denying that she shines in Flier Emblem, where her versatility and ability to pick up heavy buffs makes her reign supreme. She gets along with just about every other flier unit, particularly those who can offer her buffs such as Caeda, Minerva, Hinoka, and Halloween Nowi. Guidance Teammates: Tana's natural C slot and her Vidofnir refine also helps her to enable teams of other movement types, particularly armor units. She can help Zephiel, Zelgius, Hector, Amelia, Effie, and other armor units to increase their own mobility on the battlefield. Raven Tome Users: She works well with teams that can neutralize her weaknesses- this means that she synergizes well with raven tome users such as Lyon, Cecilia, Spring Camilla, and Sophia. While Tana has many melee units covered, ranged and magical attackers can still give her pause. Green Mages: These in particular are harmful, especially Merric. Units like Julia, Cecilia, Nino, and Soren are also harmful to her. Archers: Bows also attack her natural flier weakness, and should be avoided at any cost. These are units like Bridal Cordelia, Halloween Jakob, Brave Lyn, Klein, and others. Green Melee: These units are capable of breaking through her defenses, such as Hector, Amelia, Winter Chrom, and Raven. Although Cordelia ends up better due to availability (therefore extra merges), I prefer Tana a lot more as a character and also her art in the game. She runs a pretty standard firesweep set, I don't run moonbow heavy blade because my Raven is already using the heavy blade seal. Overall, a very good lance flier. Previously, she was -spd, but after the merge update, I was able to replace QR with another skill. Had a spare Link skill at hand, so this is the result. She can swap with an ally to give and receive a boost to Attack and Speed, allowing her to double more and hit harder. DISCLAIMER! Aerobatics is the recommended b slot! However, the builder does not have aerobatics for some reason, so I put down flier formation because it is the closest thing. DO NOT ACTUALLY USE FLIER FORMATION! Anyways, let's get to the build. Tana is great with mixed teams and is designed for them. She has a great offensive stat spread at 34/36, and also has decent mixed bulk at 61 with an even 25/25 defenses. Vidofnir gives her a better close defense with +7 def and res. Taking a boon in any stat is great, just as long as you have a -hp bane. Taking a boon in attack or speed is great for obvious reasons, while both defense and resistance have a superboon which raise it to 29. Close defense is a great a slot and an alternative, but Fortress def/res 3 is the best because it works on both phases and on ranged units at the cost of only 2 attack. This raises her defense and res to 31, and all the way to 38 with vidofnir's effect. The Aerobatics/Guidance combo is really great, and with vidofnir's special refined effect, this combo becomes even stronger. She will always be adjacent to an infantry/armored ally. This is why blue flame is also recommended, she will always get the 25 damage with it. If you don't have blue flame, then bonfire is a fine substitute. The sacred seal slot is flexible. Close defense is definitely a great pick, Quick Ripost is great but is in high demand, and even heavy blade might be a good pick. However, I chose darting stance, as this raises her speed dramatically, preventing doubles and allowing followup attacks without using QR. With the vidofnir special effect and darting stance, she gets a whopping 46 speed at neutral. I really like the concept behind Guidance skill, and the mixed team style. mostly in the Arena where you have to tank multiple foes and kill them with that single unit. This build is studied exactly for my arena team: Tana mix a solid enemy phase bulk with a good mobility, while she helps a lot to position team mates to tank or strike, second their role. Weapon is +Eff Vidofnir with this IVs, because she get the most from the bond effect (+8 stat point), but we can low attack if needed (moving out from bond status). Special is Aether because of arena score and survivability. Close def 3 is both in A and Seal slot, giveing, with Vidofnir effect, redundance and making Tana very bulky in enemy phase. In B slot I put Chill Def or Res, choosing according to my season arena bonus unit (magical or physical damage). Finally Guidance in C slot make the game, letting me to moving back tank unit when they finish their job, and letting my bonus sweeper to finish it. VidofnirIf unit is attacked by foe using sword, axe, lance, dragonstone, or beast damage, unit receives Def+7 during combat. Guidance 1If unit has 100% HP, infantry and armored allies within 2 spaces can move to a space adjacent to unit. Guidance 2If unit has ≥ 50% HP, infantry and armored allies within 2 spaces can move to a space adjacent to unit. Guidance 3Infantry and armored allies within 2 spaces can move to a space adjacent to unit.